Another Kind of Hero – Fix Bayonets! Somewhere out there, there is 40 pounds of explosives waiting to destroy an American life. On the battlefield, terrorism takes the form improvised explosive devices (IEDs). We used to refer to such things as booby traps (meaning a device used to catch the unwary); they have always had a profound psychological effect on military forces —and a devastating effect on civilian populations, as well. After the invasion of Iraq in 2003 and the disposal of Iraqi leader Saddam Hussein, coalition forces remained in that country and assumed a new mission: nation building. The axiom used by former-president George H. W. Bush was, “If you break it, you own it.” George W. Bush broke it. To combat these American forces, Iraqi and other insurgents used IEDs. It became the leading cause of death and injury among coalition forces in the region; 60% killed or injured in 2010, averaging 2.5 injuries per incident. In the case of those killed in action, injuries were so massive that there was no way to prevent their death. Among those military personnel that did survive IEDs, many also suffered significant brain damage from the concussion of the explosion. None of these people will ever return to their pre-war normalcy. How did our troops survive in this environment? How did they even muster the courage to go on patrol, realizing that there was an IED out there just waiting for them? In the Marines, the squad looks after one another. Add to this mix the dog handlers augmenting each combat patrol. An experienced set of eyes and a dog’s ability to sniff out explosives will help to save the lives of Marines; not always, but in most cases. The cost: serious injury and death among dog handlers and their canine Marines. It is an amazing story. On 8 February 2012, Lance Corporal Jarrett Hartley and his dog Blue accompanied 3rd Platoon, Lima Company, 3/3 into Loya Darvishan, Southern Helmand Province. While passing through a tiny village, Afghan National Army partners stopped to search a suspicious compound. They found several mortar castings; enough to prompt a more detailed search of surrounding compounds. The patrol avoided adjacent roads due to the increased threat of IEDs; they opted instead to cross into a nearby field, which took them through an arid canal. However, before the Marines entered the canal, Corporal Hartley noticed a darker patch of dirt that looked recently disturbed. 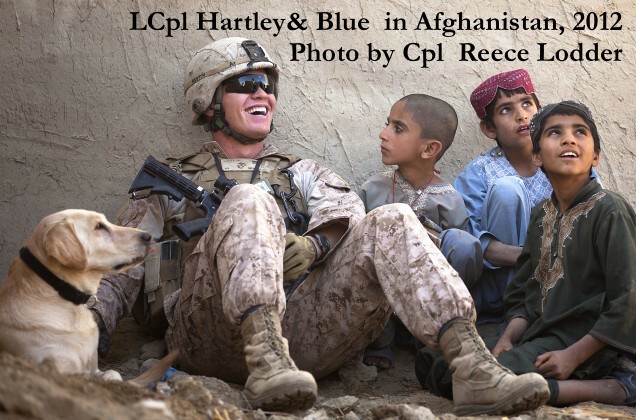 Hartley’s previous tour in Helmand Province was running and gunning for insurgents as a member of his platoon. After training as a dog handler, his responsibilities changed. He remained with his platoon, but now he had to think and care for two; now he was carrying a much heavier responsibility on his shoulders. Marine and dog have become IED hunters; they do everything together, from patrolling to boarding helicopters for movement to other areas of the province. Together, the screen pedestrians, the work vehicle checkpoints, and they rest together after exhausting patrols. They experience the biting sandstorms, the bitter cold, and the scorching heat of the summer months. Through it all, Blue seems to realize that he has an awesome responsibility, too. He acts as if he understands that he is a front line defense against death and serious injury. Nevertheless, the dogs are dogs and they like to goof off just as all dogs like to goof off. They like to jump in pools of water, chase other animals, and they get tired. Some times the animals are playful, other times they are moody. They are a challenge to their handlers, but they are saving lives and some times, at great cost to themselves. In between combat patrols, a dog handler is likely to play with their dog; playing fetch is one popular pass time and it is here that these animals provide another invaluable service; they boost the moral among fellow Marines and each of these dogs finally finds a way into their hearts. No, they are not pets. They are highly skilled working animals. No, they are not just government property. They are life savers, morale boosters, and genuine American heroes. Writer Maria Goodavage told Lucca’s story in an excellent book titled Top Dog: The Story of Marine Hero Lucca. You can find the book at Amazon. Is Lucca now a family’s pet? From what I can tell about the book, she is. Yes, returned to her original owner. I sure hope there’s a place in Heaven for these loyal animals. Saw a TV segment on the Gy, family, and Lucca. I thought they were at Pendleton. Great story. Dog seems to have transitioned to family life very well. Humans often seem preoccupied by self-pity; animals don’t have that problem. I never understand why the vermin in our society gets so much press and the real heroes, including working dogs, are rarely mentioned. Was the Gunny on Embassy duty in Finland? Thank you again, Mustang, for bringing our history to us. The information about Finland confused me, as well. According to TWS, Gunny Willingham did serve a tour on Marine Security Guard at Tel Aviv, but I see no reference to duty in Finland. 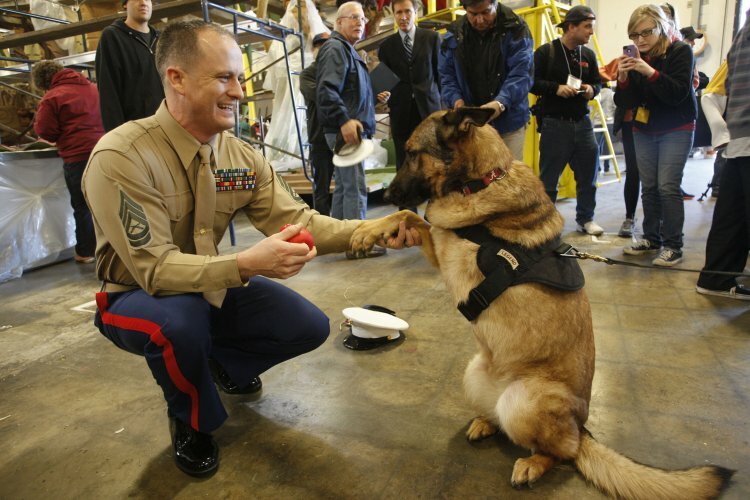 The Gunny entered on active duty in 1999, presently services as an MP/Dog Handler with I MEF. I was at Normandy standing in a tiny German cement bunker with a long narrow slit in it through which their guns were aimed at shore..at our precious boys ……Who can help thinking about all those soldiers jumping into the ocean to get to shore, knowing the guys in front would be killed…knowing, not worrying about it, KNOWING. How the heck soldiers can do that is well beyond my understanding, sadly. These dogs are amazing, aren’t they! Thanks for bringing this story to us…….These dogs sound braver and smarter than many politicians. People join the Marines to become warriors. You cannot be a warrior if you aren’t willing to locate, close with, and destroy your enemy by fire and maneuver. As for the dogs, I would think it would be very difficult to have a dog assigned to you, and then taken away once your tour of duty was up. I also wonder how it affects the capabilities of a dog after a change in handlers. If anyone can answer these questions, chime in. Outside of the casualties, a wonderful story with a great ending. Dogs are part of why I like animals much more than a lot of people. They help us in so many ways. I read recently where dogs can detect lung cancer before any current medical procedure could. Much more. Yes, I hope God has a special place for them. Surely he must. What would heaven be without our beloved four-legged friends? AOW, Yes, all of them. There are more than a few that I intend to look for as a first order of business should I get there. Soon, they came to a gate in the fence where, on the other side, they saw a nice grassy, wooded area surrounding a cool clear pool of fresh water. “Just where a thirsty ‘huntin’ dog and a man would like to rest!” thought the old man. But there was a sign over the gate that read “No Dogs” so they walked on. “‘Scuse me Sir,” said the old man, “My dog and I have been on this road all day. Mind if we come in and sit in the shade for awhile?” “ Of course!” The man said. “Come on in and rest. You look thirsty and tired.” The old man said, “We sure are!” and started through the gate with his dog. “Well, I’m stayin’ with my dog,” replied the man and he and the dog walked on. Gradually, the fence became more and more faded and rundown until they finally reached a spot where the boards fell away completely leaving a gap. Another man dressed in old, ragged clothes sat just inside the broken fence under a shady tree. Given the affinity humans have with animals, I will be shocked to think that there are no dogs, or cats, or horses, in heaven. Why should our Lord restrict the things that give us comfort? They are all Marines. Loyal to the end. The night I got back from Leyte, my kids asked to go see Max at the movies. I thought I cried enough in the Philippines. Watching the re-enactment of the dog sitting alongside his handlers casket got me crying once again. Very touching post. BTW, I thoroughly appreciated your series on Belleau Woods. The comparison to Tarawa was surprising. There is a story here about a German Shepherd named Capitán who has remained next to his owner’s grave site for more than six years. Amazing story. A wonderful story of lifelong bonding. What stories are told about these animals. They just want to please you. Too bad we don’t get to take them to heaven with us. On the other hand, think of the joy, comfort and entertainment they give us here. Heaven is so wonderful it no longer needs these little helps. Still….. I read somewhere that dogs actually believe that they and their human masters are of the same species. No doubt cats are of the opinion that the humans are inferior. We should all have more posts for these outstanding warriors! “dogs can detect lung cancer” There was a nursing home whose cat would come to sit at the bed of a person when they were near the time to die. Eerie. But the staff and residents knew where she went, that person was close to dying. When I was young my mother was extremely ill with a life-threatening infection. Our cat kept a vigil on her bed for weeks during the worst of it. This was a mostly outdoor cat. She didn’t loll around inside all day. But she only left mom’s bed to eat or pee. Then, one day, she jumped down and went outside and back to her regular habits. The NEXT DAY mom had a major turn for the better and was able to get up, fix a meal and take care of some things in the house. Coincidence? I don’t think so. Baysider, That is fascinating. I’m sure cats can feel our emotions, but I had never heard a story realted to health. Cats do provide comfort to people in nursing homes and such, but I’d never heard the health sensing angle before. Cats are excellent health sensors. On more than one occasion, one of our cats has stood vigil over us here in this household — when we were having health problems.